The theory of plate tectonics indicates that earth's surface sits on a large floating island of rock. Although it feels solid and hard beneath our feet, the outer surface of the Earth is a thin crust of fragile rock, fractured like the cracked shell of an egg. The pieces of the shell are Earth's tectonic plates -- there are 12 major ones -- and they float across a layer of soft rock like rafts in a stream, their motions driven by forces generated deep in the Earth. At their boundaries, the plates spread apart, converge, and slide past one another. Access the following link to read and observe the most common plate boundaries that occur as a result of tectonic plate theory. Then, access the link below it to experiment with the phenomena. Most earthquakes happen near the boundaries of tectonic plates, both where the plates spread apart and where they crunch or grind together (although large temblors also strike from time to time in the normally stable interior of continents). Along plate boundaries, the brittle outer part of the Earth fractures along faults. As plates move, blocks of crust shift along the faults. The infamous San Andreas fault is not a single crack where the North American and Pacific plates slide past each other. It's the largest of a thicket of faults that collectively absorb the motion of the plates. A typical earthquake sends out at least three types of waves. 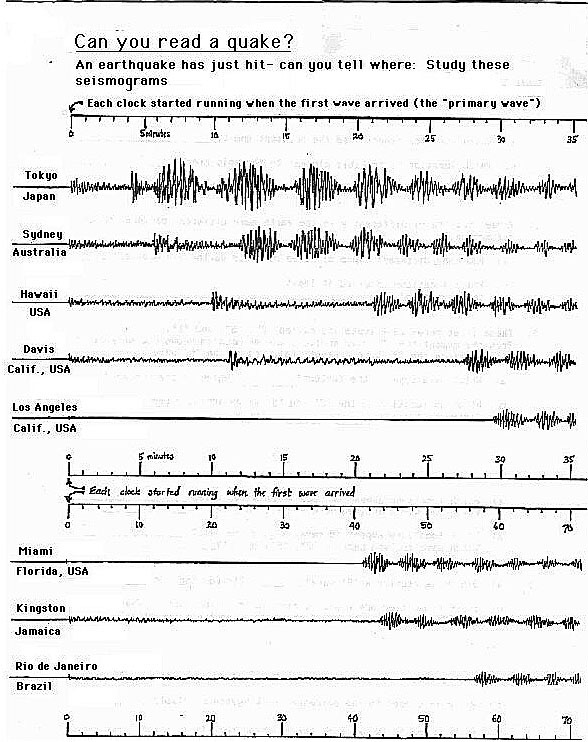 These waves travel differently in the earth and make different patterns on the seismogram, a read-out from a sensitive detecting instrument called a seisometer measuring tectonic activity. These are quite useful in detecting the epicenter or the location on the surface of the earth directly above the focus of an earthquake. Following an earthquake, the body waves strike first. The fastest kind are the primary waves, or P-waves. People often report a sound like a train just before they feel a quake, which is the P-wave moving as an acoustic wave in the air. ocean, and can literally topple buildings over. The L-waves or surface waves usually cause the most damage. Though environmental scientists argue that global warming is a real phenomena causing significant reaching effects on a variety of global systems, outspoken skeptics argue that climate change is a fabrication and fallacy. Lake National Park. And once every few hundred thousand years, a truly gigantic eruption occurs, producing deposits such as California's Bishop Tuff and having profound local and regional effects on climate and life. above the zone of atmospheric turbulence. This ash and gas layer stays in the atmosphere for up to several years and is distributed globally by prevailing high-altitude winds. The ash and gas reflect the solar radiant energy back to space before it can reach the lower atmosphere or the planet's surface, thus resulting in cooling the Earth called the albedo effect. This cooling may last, as in the case of the eruption of Mt. Pinatubo in 1991, for several years. In 1815, the volcano Tambura erupted in the East Indies, producing the so-called "year without a summer" in parts of the Northern Hemisphere such as New England, where snow fell in July, and much of western Europe, where crops failed. Do volcanic eruptions have long-term effects? Pinatubo's eruptive volume was estimated at 9 billion cubic yards (yd^3). We will study the effects of the eruption in 1991 to determine if it played a role in changing weather patterns or inspiring global climate change. ​The link for Question 23 is here. In 1912, Alfred Wegener proposed that continental drift has provided a mechanism for the diversification of life on the planet and provides an explanation for the similarities between species on continents completely separated by oceans. further understanding of speciation and biogeography, the geographical distribution of flora and fauna. Explore the animation below to identify several species that evolved during each or the primary eras described above. Then view the animation at the second link below to help you visualize how the geology of the surface of Earth changed during specific time periods. Use this information to explain how continental drift may have contributed to the specific diversity or change that defined each species.